Dave and I spent 10 days in the beautiful province of Newfoundland at the end of August / beginning of September. It was a lovely little holiday – a much needed break, and a great trip. 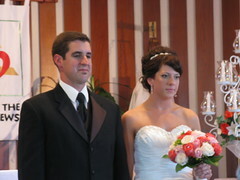 We went primarily for Dave’s cousin Sarah’s wedding, and decided to make a vacation out of it. I had never been to NL before, and Dave had only been to the Western side of the island. We had great weather and were able to do a lot of hiking and sightseeing as we drove across the province. We flew into Deer Lake on Fri night. We stayed in a cabin with Dave’s parents. Dave’s sister and her family, plus aunts, uncles and cousins, were all staying at the same spot. It was great to see the ‘east coast’ relatives and spend some time catching up. Sat am we picked up our rental car, and Sat afternoon was the wedding itself. The wedding was lovely. After the ceremony, we headed back to the cabins to relax until the reception. The reception was held in a community hall just down the road from the cabins where we stayed. Dinner was delicious, and once the tables were cleared away the party got started! There was lots of dancing and the bar was always busy. Dave and I tried to dance to a newfie waltz … we did not look anywhere close to as graceful as the older couples who were dancing to it. But it was fun! We managed to stay until midnight … but we hear the party continued until the early morning hours. Sunday morning we were up bright and early to head with Dave’s family to Norris Point, in Gros Morne Provincial Park, where we went on a great boat tour. We saw a minke whale, as well as the beautiful coastline of Bonne Bay out to the Gulf of St. Lawrence. The crew ended the tour with some live music! In the afternoon, we went to the gift opening ad Dave’s aunt and uncle’s house. Again, it was a lot of fun and great to spend time with the relatives from out east. Monday the rest of the family headed back to Ontario or PEI, and we headed back to Gros Morne to do some sea kayaking in the morning, followed by a 10km hike in the afternoon. The sea kayaking was a lot of fun – we went in a double kayak and paddled around part of Bonne Bay. After lunch at a local restaurant in Rocky Harbour, we headed out to do the Bakers Brook Falls trail – a 10km (return) trail to some beautiful waterfalls. After the hike, we headed back to the cabin in Deer Lake for our final night there. 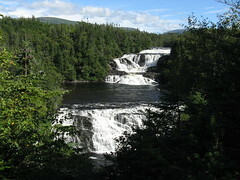 On Tuesday, we headed on another hike in Gros Morne – Stuckless Pont Trail, a nice hike around a small lake. We were sure we would see a moose on this trail – there were no other cars in the parking lot when we left in the morning, and the trail was full of various signs of moose…no such luck though. 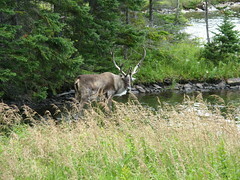 We did, however, see a caribou having a drink in the lake. We were about 6m away from it…amazing! After a picnic lunch (thanks to all the relatives who left us there leftovers :D ) we hopped in the car and headed east, out of Gros Morne and Deer Lake and over to Twillingate. 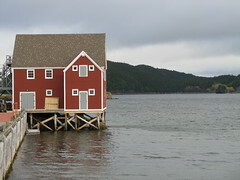 Twillingate is an island about a 2h drive North of the transcanada highway, quite close to Fogo Island. Most of the scenery on the drive across NL was similar to that of northern Ontario … rocks, trees and water. But considering the whole drive is 7-8h, it’s not too tedious! We split the drive in 3 parts … staying in two small towns along the way. 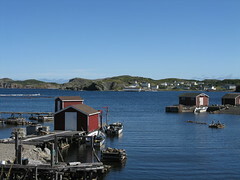 Twillingate is a small fishing village ... very quaint and picturesque. We stayed in a B&B (Rum Runners Roost) for two nights. On Tuesday night we headed out for a great dinner at a local restaurant. Snow crab was in season and it was delicious! The chef came out to show me how to properly eat the crab…and in doing so he noticed that I had received a very skinny snow crab! There wasn’t much meat in the shell … so he cooked me up another one, which was much more meaty and quite delicious. On Wednesday, we wanted to go on a boat tour. Twillingate is the ‘iceberg capital’ of the world, but we knew there would be no icebergs to see as it is not really the season, and also because there haven’t really been any floating by NL this year. But we wanted to get out on a boat and hopefully see some more whales. However, it was not to be as it was too windy that day. Instead, we went on two short hikes, ate a lot of wild blueberries on the way (well, I did), went to two small museums, and had a tour of the Auk Island Winery. There are a couple of wineries in NL – this one specializes in berry wines. Berry wines are not my favourite, but we decided to try several and ended up coming home with a couple of bottles. Thursday we headed out of Twillingate towards Gander, which we passed through on our way to Trinity. 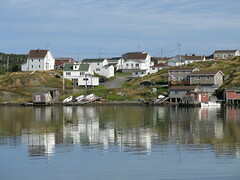 Trinity is on the same peninsula as Bonavista (where Cabot landed in 1497). On arrival, we tried to take a boat tour but again it was not to be – this time due to insufficient passengers. We learned that the tourist season in NL really ends the weekend before Labour Day … which in most cases was fine, but in some cases like this it meant that there weren’t enough people for the tour to go ahead. 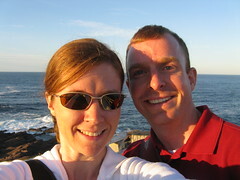 Instead, we drove out to Bonavista, and visited the landing site of John Cabot before heading back to Trinity. We had a great dinner at the Twine Loft before heading to the theater for a play which we both really enjoyed. It rained throughout dinner making the walk to the restaurant a bot soggy, but this was the only rain we had the whole trip so there are no complaints! On Friday we hiked the Skerwink Trail, a 5km trail along the cliff tops of Trinity Bay. We figured we wouldn’t see any moose on the trip since we hadn’t seen any yet and in the afternoon we were heading to St. John’s. 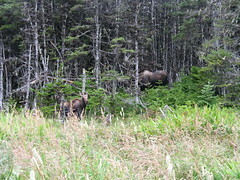 However, on the exit of the trail – standing just on the edge of the tress were two moose – a mother and baby. After the hike, we toured some of the historic sites of Trinity. The town really has things together in terms of tourism – there were about 6 houses that had been turned into historic sites with all sorts of information and people there to tell you all about it. After lunch, we headed out of Trinity and drove to St. John’s, where we would spend the remaining few days of the trip. St. John’s is a great city. On arrival, we checked into our B&B – the Chef’s Inn (highly recommended) – and headed out to Cape Spear while we still had the rental car. Cape Spear is the early-most point in Canada, and also has two lighthouses – the original one and a new one. There are also war-time bunkers and other construction from World War 2. I had no idea that the Germans sent u-boats all the way to NL and that we had defenses set up there. After a late dinner at a local brew pub (Yellow Belly – yummy!!) we headed back to the B&B for the night. On Sat we booked a boat tour for the afternoon (yes, really!! ), and headed to The Rooms for the morning. The Rooms is several museums all in one – including the art gallery and history /natural sciences. It is only 5 years old, and is very well done. After a quick lunch, we got on the boat and toured around the harbour and along the coast to Cape Spear. No whale sightings, but lots of birds…maybe a puffin or two, but it was hard to tell! Another delicious dinner in town, and then we headed to George Street to see what that was all about. George Street, for about two blocks, is the place to go out on St. John’s. There are more bars per square meter than anywhere else. We headed to a pub that had some live music and enjoyed the show. On the way home, we stopped for a pint at the Duke of Duckworth, the pub featured quite often on the Republic of Doyle (a TV show filmed in St John’s). We also discovered that the house on the show is the house directly across the street from our B&B! 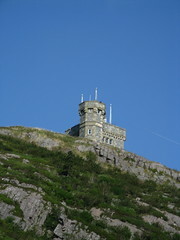 On Sunday, we headed out on the trail through the Battery, a quaint neighbourhood, to Signal Hill. It was a very windy day and the trail was along the edge of the cliffs so it was a bit scary at times, but not so bad that we needed to turn back. We just had to make sure to hold onto our hats! After the climb up to Signal Hill, we toured around the site and Cabot tower, and learned all about Marconi and his wireless communication experiments. 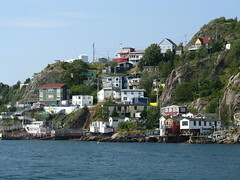 From there, we headed towards Quidi Vidi, a small town that is now part of St. John’s. After a long walk along the Quidi Vidi lake, we could see our destination – the Quidi Vidi Brewery. Unfortunately for us, Google maps doesn’t seem to understand elevations … it was very close but there was no way of getting down to it from where we were! Luckily, only a bit of backtracking was needed before arriving to a road that would take us down to the brewery. 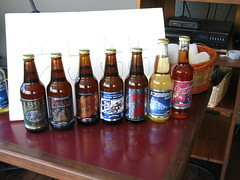 We went on a brewery tour and were given plenty of samples, plus a traveler for the tour. It was awesome! And the beer was quite good as well. We walked back into town and had a late lunch of fish and chips at the Duke of Duckworth and then went to the Jighouse and got ourselves screeched in! There was no cod to kiss, instead they used a stuffed puffin…but we did the shot of screech and said the ‘oath’. We had a lovely dinner at Magnum and Stein before heading back to the B&B for the night. Monday morning we wandered around and looked at a few of the historic sites that we hadn’t yet seen (Government House, Commissariat House…) had lunch and headed to the airport to return home. It was a great trip and I highly recommend NL to everyone! It is not to be missed. Submitted by Meg on Sun, 2010-09-19 05:46. We will have to delve into the cod tongues and seal flipper pie on our next visit ... we did enjoy some delicious quidi vidi beer though :) Plus a lot of cod..yum! Submitted by Real (not verified) on Thu, 2010-09-16 12:59. Enjoyed the read about your NFLD visit. Happy to hear it was a great trip! Did you try any cod tongues or seal flipper pie? I certainly had my fill during my one year on the rock.